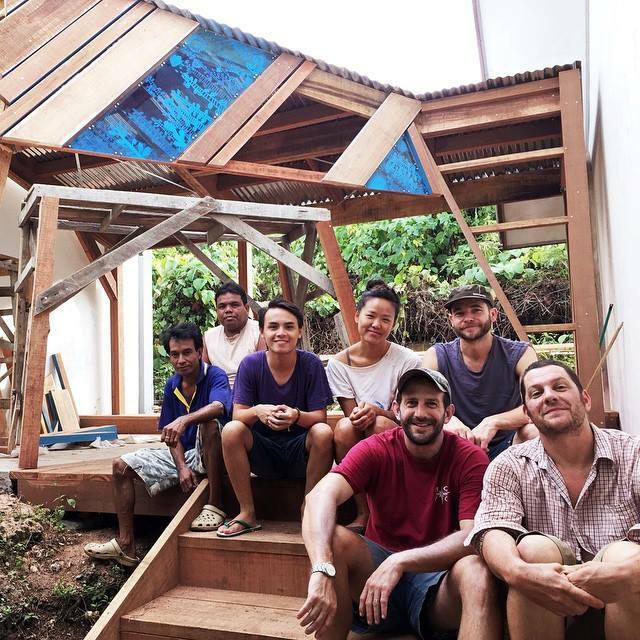 Learn To Live | Bunaken school water system completed! After three weeks planning, transporting supplies and equipment, building and sweating, the rainwater catchment system which was just a glimmer in Elizabeth Chen‘s eye last year is now a reality! Together with timber expert Oliver MacLatchy of Wood Melbourne, Elizabeth and a team of local and international volunteers took an overgrown plot between two school buildings high on a hill and transformed it into a modern space for students to gather and get clean drinking water. From the planning stages all the way to the dedication ceremony, the local community was engaged and involved in every step of the journey. Local builders were a vital part of the building process, working with our team to make it all happen on time. Christian Rau, one of our yearly LTL translators switched roles from working in clinics to becoming a builder when we put a hammer in his hand. Since he is a professional teacher, he also taught the clean water curriculum to the students on Bunaken. Now over 400 students know how the water system works and have instructions on how to create one at home! We couldn’t be more proud of our team and what they have accomplished this year: A beautiful design, created with exquisite craftsmanship, in collaboration with the local community.